11 February 2014. A group of companies and universities in Belgium and the U.S. are collaborating on an advanced imaging technology to spot signs of lung transplant rejection earlier in a patient’s recovery. Fluidda nv in Kontich, Belgium is leading the collaboration, with additive manufacturing company Materialise in Leuven, Belgium, and universities in Belgium (University of Antwerp), and the U.S. (Columbia University and University of Pennsylvania). The consortium received a grant of €1 million — $US 1.4 million — to support the project from IWT, the research funding agency for the Flanders section of Belgium. 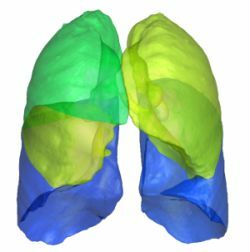 Fluidda developed a system to diagnose respiratory conditions called functional respiratory imaging that combines computerized tomography (CT) scans with computational fluid dynamics and finite element analysis to build personalized three-dimensional models of human respiratory organs. Computational fluid dynamics uses algorithms to analyze flows of fluids — liquid or gas — when interacting with solid surfaces. Finite element analysis applies mathematics to describe the behavior of a material or design under stress, and predict the behavior of a structure under certain loading conditions. Fluidda works with pharmaceutical companies to simulate behavior of respiratory organs in preclinical testing of drugs for asthma, COPD, and sleep apnea, to help identify potential problems before starting more expensive clinical trials. Materialise partners with Fluidda to build the physical 3-D models designed with functional respiratory imaging. In this project, collaboration partners are addressing the problem of relatively low survival rates from lung transplants due to rejection of the new lung. According to National Heart, Lung, and Blood Institute, survival rates for lung transplants improved in recent years, but only about half (51%) survive as long as five years. The first year after the transplant, says the agency, is when the risk of complications is highest. The consortium plans to apply Fluidda’s technology to detect indicators of transplant rejection much earlier than with current lung function tests that the company says are not sensitive enough to spot early rejection signs. The funding from IWT is expected to support development of the application, as well as early proof-of-concept clinical studies. If results of the early tests show the technology has promise, the partners plan to expand the clinical studies to more sites.